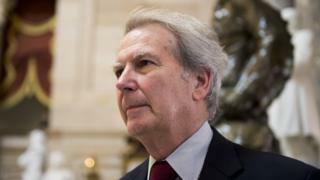 Republican congressman Walter B Jones, known for changing the name of French fries in government cafeterias to “freedom fries”, has died. Mr Jones was a keen supporter of the 2003 invasion of Iraq, and pushed for the name change in protest against France’s opposition to the war. But he later had a complete change of heart, becoming one of the most vocal critics of the war in his party. His office confirmed that he died on 10 February, his 76th birthday. Mr Jones represented his district for 34 years, first in the North Carolina state legislature, then in Congress. At the time of his death, he was being cared for in a hospice in Greenville, North Carolina, having broken his hip last month. His office said that his health declined after his fall on 14 January. “Congressman Jones will long be remembered for his honesty, faith and integrity,” a statement from his office said. Like most Republicans – and a number of Democrats – Mr Jones backed President George W Bush’s resolution to use military force in Iraq to oust its leader Saddam Hussein. Mr Bush justified the invasion by claiming that Saddam Hussein had developed and hidden weapons of mass destruction. France, which threatened to veto the UN’s resolution authorising US-led military action, was the most vocal in its opposition to the war. In response, Mr Jones and his fellow Republican Robert W Ney pushed for cafeterias in the House of Representatives to rename their French fries and French toast “freedom fries” and “freedom toast”. All of the fries in House cafeterias were renamed ‘freedom fries’. The two congressmen were successful, and the new names were met with praise and derision in equal measure. No weapons of mass destruction were found in Iraq, and it was later revealed that the war was justified using faulty information. At the same time, Mr Jones met grieving families whose loved ones were killed in the war. This caused him to have a dramatic change of heart, and in 2005 he called for the troops to be brought home. He spoke candidly on several occasions about how deeply he regretted supporting the war, which led to the deaths of more than 140,000 Iraqi and American people.